Horace Moore-Jones was born in England and came to New Zealand in 1885. 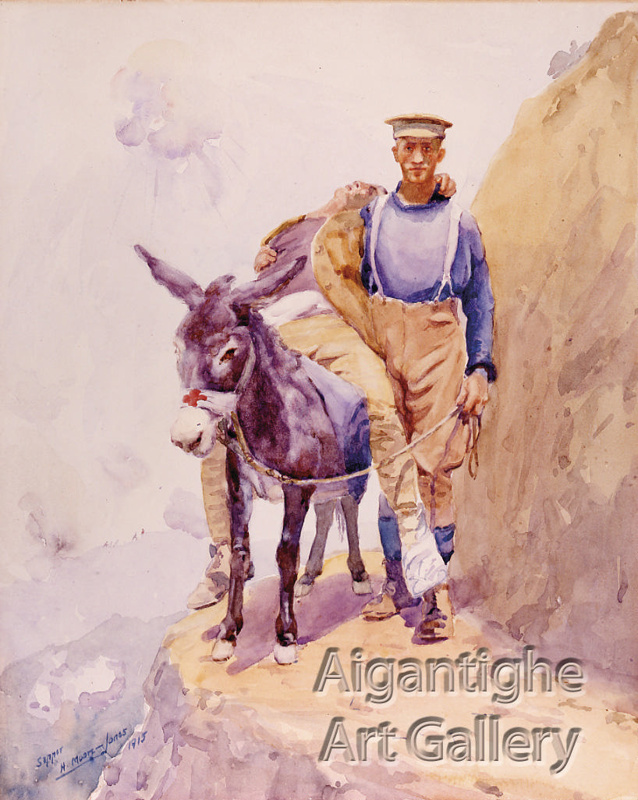 He was sent to Gallipoli in 1914 and while on combat duties he was able to draw and paint. He was wounded in 1915 and invalided back to England where in hospital he painted more watercolours based on his sketches. These soon came to the attention of the military and became enormously popular after being made into prints. Moore-Jones was discharged from the army on medical grounds in 1917 and returned to New Zealand where he organised a touring exhibition of his Gallipoli watercolours. The man leading the donkey in this painting is thought to represent John Simpson (1892-1915) who was born in England but moved to Australia. His real name was Kirkpatrick but he had adopted ‘Simpson’ earlier. He was a stretcher-bearer and was not armed. He is said to have come up with the idea to retrieve wounded men from the battlefield and to take them on a donkey called ‘Murphy’ down to the beach to medical help. This was a dangerous and brave task and he was shot dead on 19 May 1915 aged 23 while helping a wounded man. The donkey continued on carrying the wounded soldier to safety. Murphy is shown in this painting with a Red Cross bandana on his snout. However the man in this painting is certainly a likeness of Richard Henderson, a New Zealander, who took over after Simpson’s death. It is possible that Moore-Jones painted the first version of this painting after seeing a photograph of Henderson at Gallipoli helping a wounded man on a donkey, which was taken by James Jackson of Dunedin. Moore-Jones may have believed that the photograph was of Simpson. Five similar versions are known to exist of this painting. Horace Moore-Jones died while trying to save a girl from a fire in 1922 in Hamilton. Regarded as a national treasure and icon of Gallipoli this painting is exhibited proudly at Aigantighe each Anzac week out of a sense of patriotic duty and by public demand. Presented by the South Canterbury Arts Society from the collection of James Maling. See our blog for the story of the photograph that this painting is based on. It was taken by Dunedin man James Gardener Jackson.